Growing up near Buffalo, New York, I have definitely consumed a couple of boatloads of Buffalo wings. I’m a huge purist when it comes to these babies – They have to be served with blue cheese (not ranch), super spicy, and, please no – do not order them boneless!!! Now that I’ve moved to the Pacific NW, I’ve had a really hard time finding authentic Buffalo wings. However, I have a new obsession – Vietnamese Chicken Wings. My first experience with Vietnamese Chicken Wings was at the restaurant Pok Pok – a Portland mainstay by chef and owner Andy Ricker. Served in a sweet, sticky sauce brimming with fish sauce, garlic, and fresh mint and cilantro. They’re simply delicious! So good in fact, that Pok Pok now has a restaurant in Las Vegas. How cool is that?! Another one of our favorite restaurants, The Schooner in Netarts, Oregon serves a variety called General Tso’s wings – and I’ve got to say, they’ve got the uber famous Pok Pok beat. If you’re ever in the area, definitely check out this place. Located right on the bay, with a fabulous view, farm fresh produce, great cocktails and a laid back beach atmosphere – The Schooner is one of our favorite restaurants, even topping any of the great eating spots in Portland. But, I wanted to create a recipe for these Vietnamese Chicken Wings that I could create at home. And I had a couple criteria for my recipe – I wanted the ingredients to be simple and I wanted to bake my wings rather than frying them. I’ve talked of my FOF (fear of frying) before. And, even though I’m making steps towards overcoming that fear, I’m baking these wings rather than frying. I was a bet skeptical as to whether they’d turn out crispy enough, but in fact, they turned out just as crispy as they would have if you’d fried them. And the best part of this recipe? It only takes 4 ingredients! How Do You Make Vietnamese Chicken Wings? 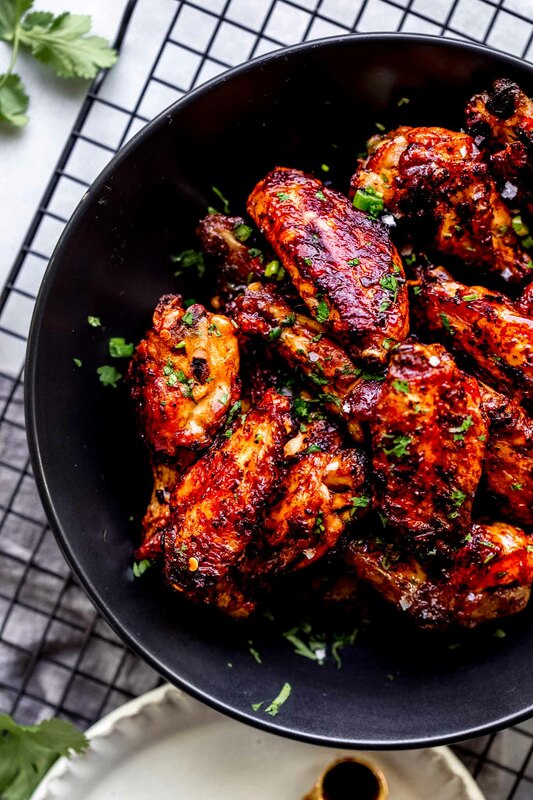 To make the sauce for these chicken wings, you only need three ingredients – sweet soy sauce, sambal oelek chili paste and worcestershire sauce. Sweet soy sauce (also known as kecap manis) is what gives these wings their incredible sweet & sticky glaze. 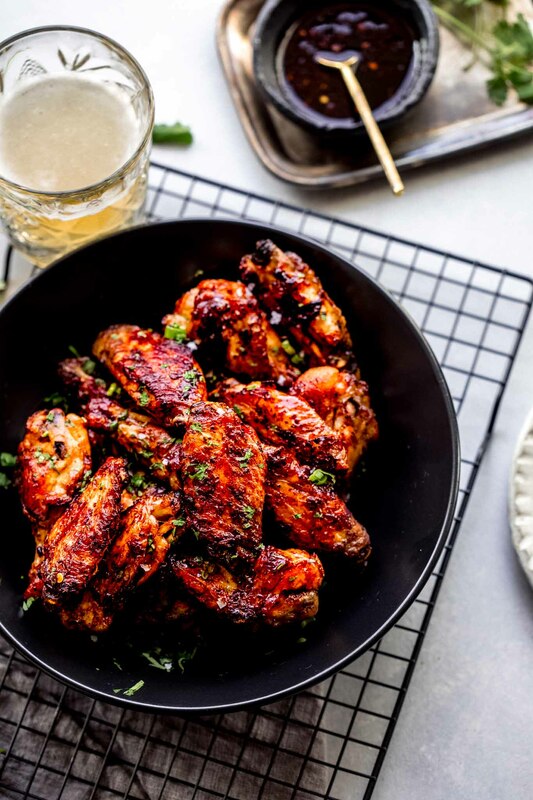 The worcestershire sauce adds some extra flavor and salt, and the sambal oelek chili paste is what gives these wings their heat. I use 1 tablespoon of the chili paste for medium heat wings, but you could go down to 1 teaspoon for mild wings, or go up to even 2 tablespoons for extra spicy wings. Since the glaze becomes so concentrated and sticky as it bakes, I’d recommend lining your pan with a Silpat, aluminum foil, or parchment paper to make the cleanup process a bit easier. 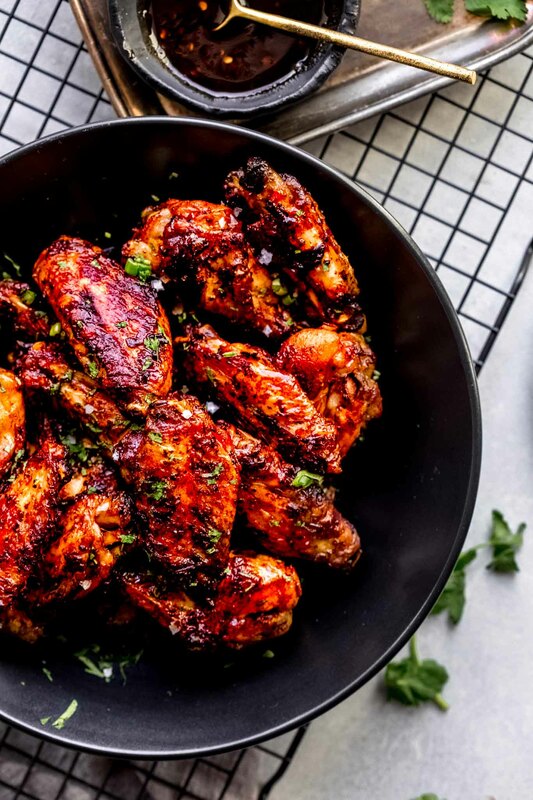 Chicken wings take 30-40 minutes to cook and become crispy in the oven. Preheat oven to 350 degrees and bake for 15-20 minutes, until heated through and crispy. Soon, I’ll be testing this recipe in my air fryer. It’s been my preferred way to make my Buffalo Wings, and I think that the process would work excellent for these Vietnamese Chicken Wings as well. I’ll be sure to share my results with you! 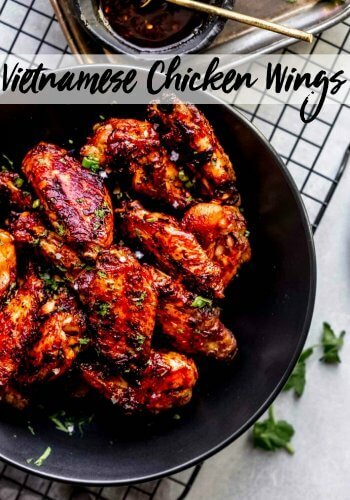 If you loved these Vietnamese Chicken Wings I would appreciate it so much if you would give this recipe a star review! Also, be sure to snap a picture of your finished dish and share it with me onInstagram using the hashtag #platingsandpairings and tagging me @platingsandpairings. Place chicken on a sheet pan lined with a Silpat or foil. Drizzle with oil and season with salt and pepper; toss to thoroughly coat. Arrange in a single, even layer and roast 20-25 minutes, or until lightly browned and cooked through. While the chicken roasts, make the sauce. Combine the soy, Worcestershire sauce and sambal oelek. When the chicken is fully cooked, transfer the wings to a large bowl. Add half the sauce and, using tongs, toss to thoroughly coat. Return the wings to the lined sheet pan and arrange in a single, even layer. Roast for an additional 10-15 minutes, or until browned. Remove from the oven. Top with the remaining sauce and sprinkle with chopped cilantro. Dry Riesling, dry gewürztraminer, dry rosé, viognier and champagne are all good matches for Vietnamese dishes. These wines have a crisp brightness that goes well with the hot, chili flavors in this dish. Looking for more Vietnamese recipes? Try this Vietnamese Lemongrass Chicken. I love these types of wings even more than Korean Fried Chicken Wings, but only get wings when dining out because of a similar aversion to frying at home. I love that these are baked but still get crispy! Pech – I was very pleasantly surprised at how crispy these got in the oven. Healthier too! Your results look spectacular. Love Pok Pok’s wings. And it’s so great to be able to make them at home. Thanks Susan! Isn’t Pok Pok great? Love it! Yum! I love that this is under 5-ingredients. When it comes to Asian or Indian dishes I am always so intimidated by the volume of ingredients. I agree Meredith – Definitely a plus for this recipe – Just a few ingredients that are fairly easy to find! Thanks Jenni! I hope he enjoys it! I love Pok Pok and really fear frying things so this is perfect, thanks! Yay Kira – You’re telling me I’m not alone in my FOF! Usually when I go in to a Non-Indian blog, I am so wary that half the ingredients will be stuff I can’t find here. But this is so beautifully doable. Thanks for the recipe. Pinned for later. Of course! I hope you are able to give these a try – They’re delicious! These look so tempting right now, and it’s midnight! Now I want Vietnamese chicken wings! Love the short list of ingredients, too. I just might have to make this soon! They look fantastic! Can I come over for dinner? I don’t feel like cooking at all today but so so so so wish I could take a bite of those right now! Anything that involves Worcestershire sauce and cilantro must be good! Those are two of my favorite ingredients Jessica! I just made these, it was a huge hit with everyone! Extra bonus, baked not fried. So tender, and meat just fell off the bones! Yay – I’m so glad everyone loved them Patti! Buffalo gals 🙂 How cool Heather! Vietnamese food has some great flavors. It’s no wonder you found yourself moving onto this niche after finding no true placement for your authentic favorite back home. What makes these wings Vietnamese? Oelek are both Malaysian ingredients. These wings are sooooo good!!! The sauce recipe multiplies really well too. I made 4.5 lbs wings so I multiplied the ingredients by 3 and it was perfect! I’m so happy to hear that – Thanks Ciru!